The people of Arboleda and San Lorenzo (Nariño), tired of constant aggressions and the lack of consultation on mining development projects in their communities, reject the presence of the multinational Mazamorras Gold. On Monday October 10, 2011, residents of Arboleda and San Lorenzo - two municipalities situated in northern Nariño - set fire to two exploration camps belonging to Mazamorras Gold, a subsidiary of Canadian multinational Gran Colombia Gold. Representatives of Mazamorras Gold estimate that damages resulting from the fires, which they say destroyed all samples taken during one year of mineral exploration, totaled $1.5 million. To date, the company has invested $3.8 million in mining exploration, and $4 million more in the acquisition of four land concessions for the project in September, 2010. According to the company, the community’s actions were premeditated and illegal, performed by a group of hooded people that carried pots, sticks and cans of gasoline. While local radio stations denounce the irreparable damages caused, the company’s international press releases assure that the attacks would cause no damage to their reputation, nor would they interfere with future projects. The community, however, maintains that the reaction was a response to a series of provocations and aggressions on behalf of mine workers, that it was not a premeditated act, and that the sticks they carried were ceremonial peace staffs they use to exert authority. Days before the burning, workers from the company occupied a soccer field in Bolivar, San Lorenzo. Responding to this act, the community gathered, declared their disapproval of the workers' presence, and asked them to leave. On Saturday, October 8, the workers came back for the third time and, according to the Permanent Committee for the Defense of Human Rights in Nariño, attacked the community, wounding a woman and a child. The community insists that Mazamorras Gold – which obtained an exploration permit in 1998, and has been drilling in Arboleda and San Lorenzo since January – must leave. On October 9, 2011, during the morning hours, mine workers arrived at the community soccer field in Bolivar to perform cleaning tasks as part of the company's community service program. Members of the community, who had been demanding the expulsion of the company for months (at meetings, forums, peaceful marches, and even a public audience with municipal land authorities), stopped the workers from cleaning. However, Nestor Cúbides, a retired military officer who is now chief of security at Mazamorras Gold, obliged the workers to carry on their duties, ignoring the demands of the community. It was then that one of the inhabitants shouted: "Those who do not want to support the community should go to the mines and stay there. Don’t come back to the community." One of the mine workers responded by beating him up. When the man’s sister and niece protested, they were also beaten. Mazamorras Gold reported that none of its employees were hurt during the episode. The community says that this is not the first aggression committed against those who have declared themselves against mining. They also insist that the sugar cane farm and mills of one of the community’s most active members opposed to mining were burnt down. They add that another member of the community has received death threats. The following day, October 10, 2011, what began as a small protest of 30 people turned into a massive rally of 800 villagers peacefully occupying the mining camps. People from the neighbouring towns of Leiva, El Rosario, La Unión, Génova, San Jose and Taminango joined the inhabitants of San Lorenzo and Arboleda in their protest. The demonstrators declared their rejection of large-scale mining in the region and demanded the expulsion of the company. At three in the afternoon, the community set the two mining camps on fire. According to some versions, they gave mine workers a chance to take out valuable objects, like computers. Others say that members of the community, strangers and some of the company’s own workers took advantage of the situation to loot the grounds. Half an hour later, the 'mediation commission' that the community had requested arrived. The demonstrators, Edgar Salazar – an engineer speaking on behalf of the company - and the community began negotiations in the presence of the Interinstitutional Commission of Mediation and Guarantors. The commission included the Peace Assessor of the Department of Nariño, Zavier Hernández, (representative of the Sub-Secretary of Mines of Nariño), the Ombudsman's Office, and municipal authorities from Arboleda and San Lorenzo, which were accompanied by the Commander of Operations of the National Police of Nariño. "We haven’t slept or eaten, we have families, and we need an answer now. You can return to your comfortable hotel, but this is our lives, our future." They stated that if the mining company continued to occupy the region, the community would continue to protest until they left. Towards the end of the negotiations, a group of miners armed with sticks and machetes, evidently furious and inebriated, approached community members in order to intimidate them. They were stopped by the police. At 8pm, Edgar Salazar agreed to cease all mining activities during one month, while a forum could be organized. However, the morning after, he personally called the Peace Assessor of Antioquia to communicate that he had met with the Vice President of Colombia, whom had assured him that the procedure was illegal due to the fact that Mazamorras Gold did not sign any agreement. He also said that the company would pursue legal actions against those responsible for the damages. According to sources within the community, the company met with their workers a few days after the incident and assured them that all activities would continue in a week’s time. They were told that legal procedures were going through which would sure up all the necessary permits to occupy land in the region. They were also told that the company would hire private security and would ask for the protection of a military brigade in the area. Mazamorras Gold is one of six Colombian projects owned by Canadian company Gran Colombia Gold. The company holds 43,000 acres of land concessions in Colombia and has begun work in Mali and Venezuela. According to the company, the Mazamorras Gold project occupies 5,993 acres in northern Nariño, where Colombia’s Andean mountain ranges converge. The area shows great potential for copper and gold mining development. The company has told its investors that it holds the necessary environmental licenses to begin drilling, including water concessions which allow it to access to public water sources. In January 2011, Mazamorras Gold began the drilling process, for which it hired Lowell Mineral Exploration Company, and then Kluane Drilling Ltd. The company reported that they extracted an average of 2.35 grams of gold per ton of earth that month. Engineer Edgar Quintero of Mazamorras Gold has stated that open-pit gold mining is possible starting at 1.5 grams per ton. In order to obtain one ounce of gold (a little over 30 grams), over 20 tons of rock must be removed. According to William Sacher and Alberto Acosta, sites with high concentrations of precious metals are fast disappearing. However, the high value of minerals on the world market continue to make mining a profitable enterprise, even in regions where mine deposits are scarce. Extracting minerals from these deposits requires large-scale industrial mining, including the use toxic chemicals and large amounts of water. The process also produces large quantities of waste. In a very short period of time, large-scale mining extracts massive amounts of minerals that have taken thousands of years to form. The company’s drilling platforms are located in San Lorenzo and Arboleda, two municipalities separated by the Mazamorras ravine, from which the company took its name. Arboleda, founded in 1859, is Nariño’s oldest municipality, and was declared a National Monument and National Archeological Reserve in 1971. It was an obligatory stop for caravans crossing the country from south to north during the European conquest, the colonial period, and during the country’s campaigns for independence. It is a site that has served as a strategic point for many historical figures like Antonio Nariño, Simón Bolívar, Antonio José de Sucre and Julio Arboleda Pombo, who died in the village of Olaya, where the company has built its exploration camps. According to Article 35 of Colombia’s Mineral Code, a special permit is required to initiate projects in National Monuments and Reserves. The community has asked the Ministry of Culture and the National Institution of Architecture and History for information on their situation, but has received no answer. According to Earthworks, over a quarter of mining activity worldwide is located within or very near parks, national reserves and other protected areas. Santa Teresa mountain, near the town of El Volador, municipality of Arboleda, where, according to local legend, golden hens and chicks have appeared. The original name of Arboleda was Berruecos, which means “site full of rocks”. (In 1914 it changed its name in honour of General Julio Arboleda, assassinated there in 1861.) Gold rush legends are still told by town elders - stories of golden hens and guayungas, or golden corn cobs, in the hills of Santa Teresa. Although the Spanish extracted gold here during the colonial period, the region has since had little to do with mining. Residents describe San Lorenzo and Arboleda as established coffee-growing regions, due to their fertile lands. Because agricultural activities are profitable, most people in the area are farmers. Early this year, Mazamorras Gold asked property owners if they could build drilling platforms in the area. Many of them agreed and consented to the company’s presence. Now, however, the community complains that they were given very little information about the project. "The company entered and began making holes in our lands without consulting or explaining anything to us as a community," says one inhabitant of Arboleda. People in the region began to gather, especially around agro-environmental schools, organized by the Committee for the Integration of the Colombian Massif (CIMA), in order to talk the situation over and learn about the effects of large-scale mining. According to members of the schools, the majority of residents decided that they did not want the mining company on their land. The company has met with the communities in response to their opposition. However, they have only spoken of the benefits of mining activities and have limited their talks to the exploration phase. "They don’t tell us what comes after the exploration phase," said a woman from the village of El Volador. The company says it is directly providing 200 people in the area with employment, although many others say that these jobs have been temporary, monthly contracts with no guarantee of renewal. Arboleda has a population of 8,400, while San Lorenzo has over 20,000 inhabitants. "The mine doesn’t bring development, like the company says," insists one of the community members. "There are only a few independent economic opportunities in the mining industry, and we are being deprived of the lands we sow. If we come to rely on mining, this will not generate long-term economic stability. We now know that the majority of jobs are only needed during the exploration phase, and that these are scarce and require highly-specialized training. The minerals will be used up eventually, and we will be left jobless in a deserted, unfertile land." According to Rights in Action, on average, these types of mining activities last no longer than 10 to 15 years. Since the arrival of Mazamorras Gold, the company has been paying workers between 20,000 and 30,000 thousand pesos per day. Money earned from a day’s work in coffee fields only amounts to between 7,000 and 12,000 pesos. This explains why the company’s offer has been well received by many, especially the younger crowd. The company has offered jobs to key people, many of them community leaders and members of the agro-environmental schools who were formerly opposed to mining, though many have refused these offers. Radio and television programs are constantly asking people to support the mine and its workers, while at the same time the company has hired private security to guard the community’s main communication antenna. On August 20, 2011, a march and open council meeting against large-scale mining was held in Arboleda, at which 200 members of the community expressed their will by means of a referendum. After the event, authorities, headed by the mayor and members of the Council of Arboleda, gave their full support to the community, declaring themselves in opposition to mineral exploitation and vowing to support agriculture. To date they have done nothing, says one inhabitant of the village of Santa Teresa. Instead, the town hall of Arboleda asked for police reinforcement in June, and in September sent a communication to the national government, indicating the results of the referndum. Days later, a march was held in favour of mining. According to sources in Arboleda, the company sponsored the march, buying t-shirts, paying transportation fees and food, as well as obliging mine workers to take part, and to bring along four other people. The majority of the mine workers are from Arboleda, while some are from San Lorenzo and various smaller communities. They are strongly behind the company’s decisions. They say they also have families, that they need their jobs and have no other option. But others in the region have noted a large increase in alcohol consumption, and parties in nightclubs and pool bars, since the arrival of the company. The social divide that these events have brought upon is serious. "Before the arrival of Mazamorras, we lived in peace. There were no disturbances, people weren’t threatened, and now they are," says the mayor of Arboleda. “...the workers of the mine have turned into a group which threatens the community, verbally and physically attacking the inhabitants of municipalities, creating a constant state of fear and psychological distress. The result has been a radical change in the life of the community. The peaceful coexistence that used to be the norm, and the social and family fabric of the region, have been broken." Mazamorras Gold hired a private security company, Coservipp Ltd., which employed 60 young people from the region, all of whom had undergone prior military training. They were all given weapons. Many people from villages and hamlets have since complained that people in expensive vehicles, dressed in black and sometimes hooded, have been patrolling the region, spewing threats to community members. "We had never seen that before the arrival of Mazamorras," says an inhabitant of San Lorenzo. "Santa Marta (a hamlet in the area) was very calm, we have no police, we govern ourselves, work as a community and take care of each other." Since June, some community members have reported receiving death threats over the telephone. They also state that they have seen people on motorcycles yelling out similar messages. According to some mine workers, the company’s engineers regularly single out and threaten community leaders. One engineer, for example, alledgedly made derogatory comments about the nearly 100 inhabitants of Arboleda and San Lorenzo whom attended the "Land, Territory and Sovereignty Congress" in Cali in the beginning of October, 2011. In June, a mine worker decided to quit for reasons that have not been clarified. He was then murdered. Local authorities have not yet taken action to clarify the circumstances of his assassination. In August, one of the company’s pickup trucks was set on fire. The company declared that it was an accident, yet neighbours of the area believe the fire was caused by mining opponents. On October 11, one day after the community set fire to mining exploration camps in San Lorenzo and Arboleda, the newspaper Diario del Sur published an article stating that the company had opened gunfire against the community, wounding seven people. "False information only worsens the situation and makes it more dangerous for us," say the people of Arboleda. A member of the community who belongs to the company’s security forces commented: "Yesterday I put away all my weapons to avoid any problems. The article is a lie." Now the company is threatening legal action, assuring that they will search for and imprison those responsible for the burning of their mining camps. Employees of the departmental government of Nariño, and spokespeople for the governments of Arboleda and San Lorenzo, have declared the same thing. Yet no one speaks of legal action and the imprisonment of those responsible for setting fire to the sugarcane fields and mills of those opposed to mining in Santa Marta. In addition to the social problems that have arisen since the arrival of Mazamorras Gold, the community has denounced various environmental irregularities. 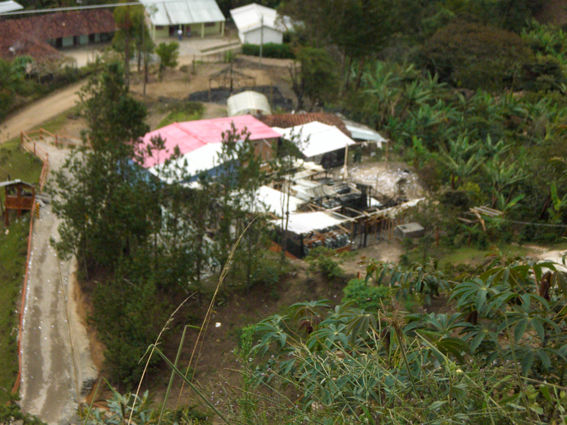 Drilling site in the village of Santa Marta, in the municipality of San Lorenzo. The owners of the land have tried to sow beans and coffee here, but the land is now less fertile than it was before. At one point, the company was drilling 24 hours a day, (taking turns over 12-hour shifts). The noise and light pollution produced by the platforms interrupted nearby residents' daily work schedules, and forced a school in El Volador to suspend classes for a number of days. The company offered compesation in response to complaints, offering paint, for example, to the school. Drilling site in El Volador, in the municipality of Arboleda. The company, Mazamorras Gold, reforested the site months ago and little has grown. Whole areas of trees, grass and crops were deforested for drilling activities. Now, months later, the lack of density in the soil can be seen as much as 30 kilometers around the original hole. The vegetation has not grown back. The company’s attempts at reforestation in the area have all failed. The owners of some properties in Santa Marta decided that they would no longer give permission to the company to use their land. 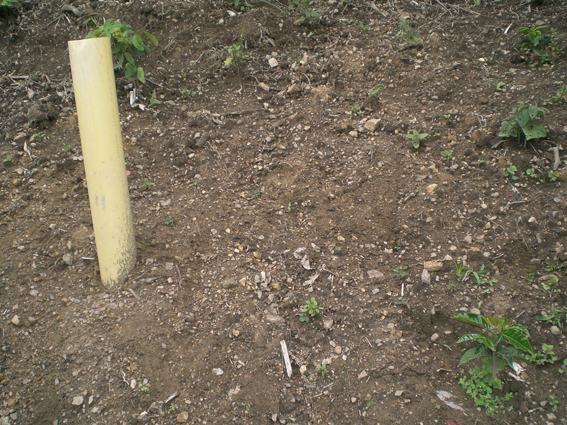 They planted coffee and beans in the area where the drilling had taken place. However, the beans have not grown and the coffee has taken longer than usual to develop. In September, the community sent a letter to the Ministry of Mines and Energy, soliciting an official statement on the matter, but they still have received no response. The letter stipulated that one centimeter of ground takes at least 200 years to form, and once the minerals and nutrients are extrapolated from it, they cannot be recovered. The quantity of water that the company needs to carry out mining exploration activities also worries neighbouring communities. The water is supplied by communal fountains meant for public use and, according to what an environmental engineer at the mine declared in May, the exploration project will use 2,500 liters of water per second in order to explore one acre of land. Groundwater leak at a drilling platform in San Lorenzo. Residents believe that the water comes from the Maruchilla Lagoon. On top of this, a large quantity of subterranean water is now flowing from two uncontrollable leaks produced during the drilling process. Local inhabitants believe that an underground water source from the Maruchilla Lagoon, in the mountains of San Lorenzo, was hit. This is the main source of water for many in the region. 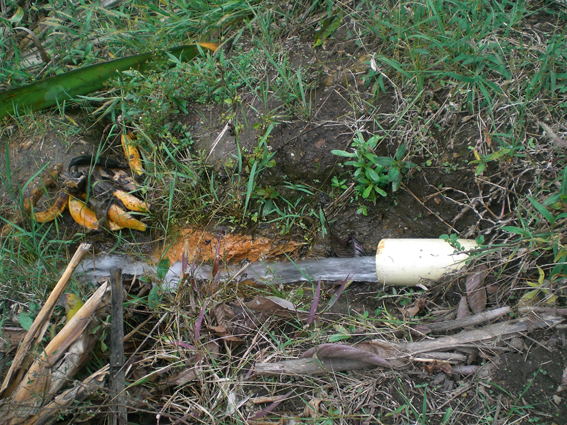 The company has redirected these leaks, by means of PVC piping, to the Mazamorros ravine. However, the community also worries about the smell of sulfur that is coming out of the water, and the clayey, brick-coloured material, similar to melted iron, coming out of the piping. According to many academic sources, one of the most devastating consequences of large-scale mining is the drainage of acid into the water, which can eliminate entire species. Drainage occurs when sulfur from rocks that have been displaced from the subsoil to the surface come into contact with oxygen in the atmosphere (air and water). Oxidation creates sulphuric acid, which leaks into the environment. In nature, sulphurs remain in the subsoil, which prevents them from coming into contact with air. Only small bits of this deposit reach the surface. Acid mine drainage can last hundreds of thousands of years and can be particularly serious when mining exploitation occurs near water sources, or at the head of water basins. 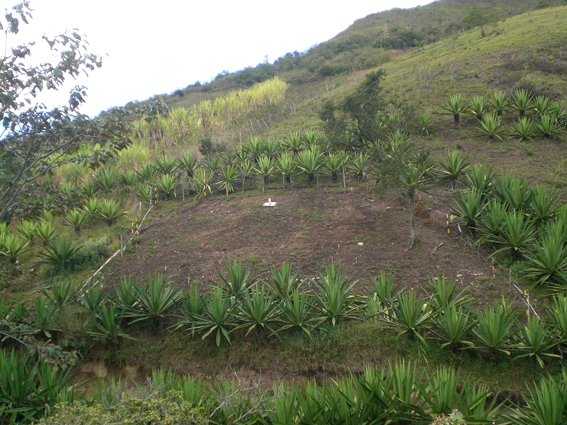 Site of a drilling rig in an area where sisal has been planted. The company stopped working here months ago, and nothing has grown. "You throw various chemicals into the water, like Platinum Pac, Poliplus, Bentonite, Rodis and Roket. The water is pumped 700 meters deep within the earth. In some parts it enters directly into contact with the ground, though at most points it is separated from the soil by an iron tube. Inorganic compounds like Betonite and other clays increase the water’s viscosity, while Platinum Pac and Rodis are used to avoid collapse. Fuels, oils, grease and drilling additives are also used as lubricants to reduce friction. All waste is disposed of in open pools lined with plastic to protect the ground. Anytime this liquid falls on the grass, the engineers become very stressed, and we have to stop all activities during half an hour to clean the surface and avoid any trouble with environmental inspectors." The community does not know if these chemicals are toxic, and the company has not given any explanation as to what they are. They worry about two platforms that are beside the schools of Bolívar (San Lorenzo) and El Volador (Arboleda), where children spend whole days. Other platforms stand less than 20 meters from the ravine. In the village of El Volador, five cows that had been drinking water near the platforms suffered miscarriages. The Colombian Agricultural Institute studied the situation, and were able to prove that the miscarriages were not due to natural diseases. Some say that there has been a high incidence of diarrhea in the community, which is very unusual for the region. A villager from Arboleda notes that while the community is worried about the quality of their water, company engineers import bottled water for their own consumption. Despite the turmoil in Arboleda and San Lorenzo, the Canadian company Gran Colombia Gold, which owns five projects through subsidiaries in Colombia (including Mazamorras), believes the country is ideal for mining development and assures its investors that the World Bank has declared Colombia the safest place for doing business in Latin America. Also, according to Forbes magazine, this stable democracy has an excellent level of economic protection for its investors. Colombian legislation is supremely favourable to the private interests of multinational companies. "The government has appropriated the land, the subsoil and the air, even the electromagnetic spectrum, and now it can negotiate with these goods that formerly belonged to the community, yet they are the property of our nation, not of the state," says a member of CIMA. In 2005, the government of Alvaro Uribe Vélez brought forth an initiative called 'Vision 2019: Colombia as a Mining Country'. According to this plan, by 2019, Colombia will be one of the top three countries in Latin America with the highest levels of Foreign Direct Investment (FDI) in the mining sector. The document also maintains that private investment is the only means for boosting and producing development. Dozens of mining transnationals have arrived in Colombia ever since. Between 2002 and 2008, Colombia’s FDI increased 400%, according to the Central Bank. According to journalist Alfredo Molano Bravo, there are 20,000 concession requests, which represent 20% of the country’s national territory. Over 9,000 mining titles have been conceded. 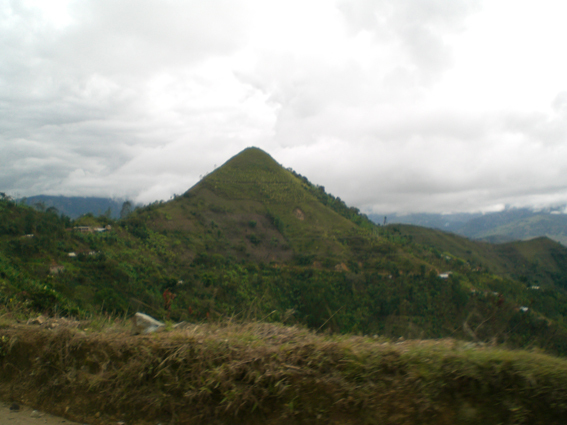 The Department of Nariño is a relatively unexplored region with great potential for natural resource extraction. Traditionally, the region has invested in agriculture, an activity that represents 39.5% of the local GDP, according to the 'Regional Development Plan 2008 – 2011'. The document also asserts that the numbers refer mostly to subsistence agricultural activity, as more than 80% of properties are less than 5 acres wide; 48% of these are less than 1 acre. Mining represents 2.35% of the region’s annual GDP. Despite the region’s agricultural focus, the country’s 'National Development Plan 2010 – 2014 : Towards a Unified Colombia: The Road to Democratic Prosperity' – a document still in use by current president Juan Manual Santos – states that Nariño's future economy will be based on mining. This, the document argues, is in order to promote economic growth, employment opportunities, and to reduce poverty. Nariño is listed fourth amongst the Colombian government's mining priorities, after Antioquia, Chocó and Cauca. Before 2002, the only multinational mining company in the region was Gran Colombia Gold, which held titles for mineral exploration in Arboleda and San Lorenzo. Between 2002 and 2011, the quantity of concessions in Nariño rose from 53 to 922, in 52 of 64 municipalities according to documents from Ingeominas. The concessions make up one-third of the region. According to CIMA, communities in northern Nariño, are deeply worried, given that they depend on this conceded land for their subsistence. The largest companies in Nariño are AngloGold Ashanti, Anglo American Colombia Exploration, and the Canadians: Gran Colombia Gold and Eco Oro Minerals, (formerly known as Greystar). In many cases, these transnationals are carrying out initial exploration activities in order to identify mineral deposits within their concessions. In some areas, this has led to the appearance of paramilitary groups and violence, including a massacre, which took place in the township of Villanueva, in the municipality of Colon de Génova, this June. This area is in demand by AngloGold Ashanti. Apart from the Mazamorras project in Nariño, Gran Colombia Gold holds concessions in Zandor Capital, Segovia (Antioquia), Frontino Gold Mines, El Zancudo in Titiribí, and the Providence Project in Concepción (Antioquia). The company also bought the Marmato mining project in Caldas in June 2011, and began relocating the town as early as August, in preparation for the construction of an open-pit mine. When Restrepo Idárrga, a priest and member of the Prodefense Civic Committee of Marmato, publicly declared himself against the displacement of this community, and approached the United Nations about it, as well as leaders and the media in Bogota, he was assassinated. To date, his murderers have not been identified. 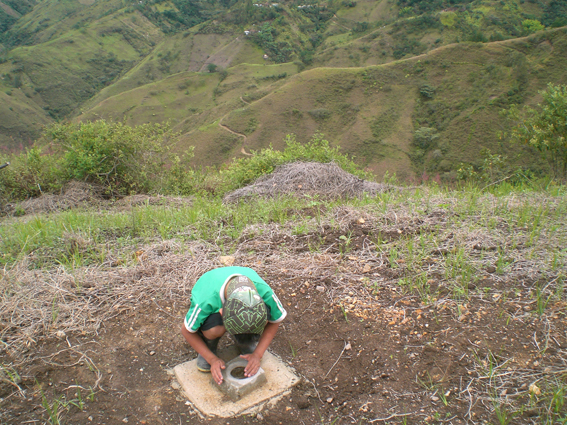 Despite the fact that Gran Colombia Gold declares that part of its work is to boost the economic development of areas where it operates and create employment opportunities, in September 2011, the company fired 603 workers (42% of personnel) at its company, Zandor Capital (formerly Frontino Gold Mines), in Segovia, Colombia, in order to reduce costs. Currently, Gran Colombia Gold produces approximately 90,000 ounces of gold per year. It hopes to begin producing 630,000 ounces of gold in 2012. "This year our goal is to become Colombia’s number one gold producer and extract 100,000 ounces," says the president of the Canadian company, María Consuelo Araujo. Araujo, the former Minister of Foreign Affairs during the presidency of Alvaro Uribe, withdrew from the ministry due to investigations against her brother and father surrounding their ties to paramilitary groups. Gran Colombia Gold describes itself in its listing on the Toronto Stock Exchange (TSX) as a company that specializes in financing projects in high-risk areas where there is conflict and opposition. The TSX acquires most of its funds by means of “private collocations”, meaning that most of the money comes from big ‘institutional' investors. These include banks, mutual funds and pension funds, which are known for their lack of transparency. This, in turn implies that: 1) many Canadians (an estimated 49%) own stock, in one way or another, in the mining sector; and that 2) it is very difficult to trace back funds allocated to mining activities. 52.7% of capital invested by transnational mining companies in Colombia originates in Canada, a country which has about 10,000 abandoned mines within its own territory. Now, thanks to the Colombian legislature, countries like Canada have set their sites on Colombia’s mineral resources. Companies enjoy high levels of protection due to international free trade agreements that insure the capital that they invest. Trade agreement protections have been used to impose mining projects wherever there has been resistance from affected local communities. Not much will be cleared up in San Lorenzo and Arboleda until the Government of Nariño summons its promised mining forum in mid November. The event will bring together Ingeominas officials, the Ministry of Mines, the Ministry of Environmental Affairs, Corponariño, local mayors, the Catholic Church, various NGO’s, Gran Colombia Gold, and members of the community, to debate on mining, analyze its consequences and suggest possible ways forward. Nearly one hundred people from Arboleda and San Lorenzo travelled to Cali for the 'Congress of Lands, Territory and Sovereignty' in September 2011. Here, they proposed a national civic strike as a unifying strategy for all communities affected by mining. Delegates from Nariño estimate that 65% of Andean territory will be affected by mining.